Love Your Dog, Give Her a Warm and Sweet Home! Pets love their own space, and this pet tent is perfect for indoor and outdoor use, the home, yard, beach, camping, and more. It's not only a pet bed, cat and dog rest room but also a pet toy house, play room. The dog teepee is Pure White and unique Native American designs that suit your home decoration and perfect decorate your living room. Both you and yourpet will love it. What's the Best Size for Your Pet? We have two tent sizes (L & S). Please check the product dimensions and measure your pet before buying. If you pet height is under 15 inches and weight under 15.5 lb choose the small teepee (S); If your pet height is 15-23 inches and weight 15.5-33 lb choose the large teepee (L). In between size choose the larger one. Please refer to the picture for the detail dimensions. Note: The cushion and chalkboard is not included. 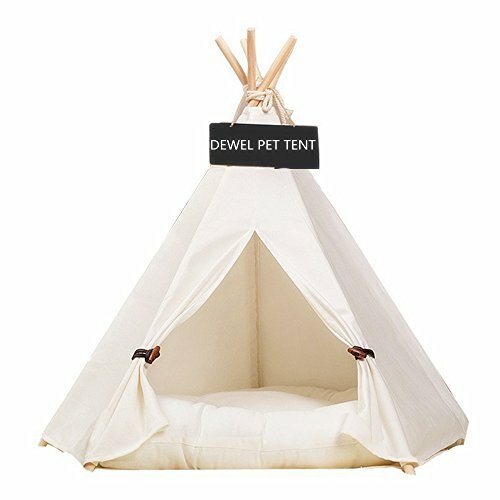 DURABLE: The pet teepee is made of 100% Cotton Canvas, and the support structure is New Zealand Pine Pole. It's easy to set up. MACHINE WASHABLE: The dog play tent is detachable, washable and portable. PET SWEET HOME: The tent uses unique Native American designs that suit your home decoration and perfect decorate your living space, beautiful play house for your lovely cats, dogs, and other pets. PACKAGE INCLUDES: 1* Cotton Canvas Tent + 5* Pine Wooden Pole (The cushion and chalkboard is not included).